I was born in 1933. I’m a retired businessman, now living in a small town in Kansas. I have a background in Management Science and Industrial Engineering. I also served for two years in the military, stationed at White Sands Proving ground. I am blessed with a loving wife, three grown children, five grandchildren and one great grand child. My first attempt at putting something in a light bulb was a Revel Model of a “Little John Missle” in a 1,000 Watt light bulb. That was in 1958 while I was in the military. It is still in tact but needs a bit of restoration. It features a neon light in the end of the missle to give the impression that it is ready for launch. My main hobby is the restoration of time keeping devices such as pocket watches and clocks as well as the design and building of unique time keeping devices. This led to the design and building of two clocks in a single light bulb, that is now completed. Living and working in the Chicago, Il area I had a daily commute time by train that took about an hour each day. That provided the time to sketch and plan how one might put a clock or maybe even two clocks into a light bulb. After visiting almost all of the tall buildings in downtown Chicago, in an effort to find a 1,000 Watt light bulb, I found that most of the tall buildings had converted to more energy efficient lighting. That is except for the Lyric Opera House, which happened to be on the route that I took in my daily walk from the train station to my place of employment. I became a friend of the ticket master and happened to ask him about the possibility of that kind of lighting at the Opera House. A couple days later he called my name as I walked by and reaching under the ticket counter he pulled out a paper bag which contained the 1,000 Watt light bulb I needed. That bulb now contains the installed double clock. It is a completely functional assembly of two clock movements inside a 1,000 Watt light bulb. All of the components are inserted through a hole at the base of the bulb that is 1 inch in diameter. The bulb has the typical shape of an incandescent lamp. It is 6 and one half inches in diameter and 12 inches tall. The dials of the two clocks are 4 inches in diameter and the two back-to-back movements are 2 inches deep. The clocks are supported by a central support column made of brass tubing that is then mounted to a support bracket fastened with allen screws to a brass ring soldered to the inside of the base of the bulb. The assembly of the clocks inside the light bulb requires some special made tools to mechanically connect the components. The two movements are assembled inside the bulb and then fastened together back to back with allen screws. The two movements are quartz movements with a shared quartz module and battery supply, hidden in the base of the bulb. The movements can be adjusted time-wise by a long shaft that is enclosed in the support column and can be engaged with the time adjusting knobs in each movement. The base for the light bulb clock when finished will be made from a solid block of clear acrylic 4 inches thick and 12 inches in diameter with a threaded socket turned into the base, allowing the bulb to be screwed into the base as you would with a normal light bulb. I also have three other (one-of-a-kind) clocks that I designed and built. One of those took first place in a national contest. 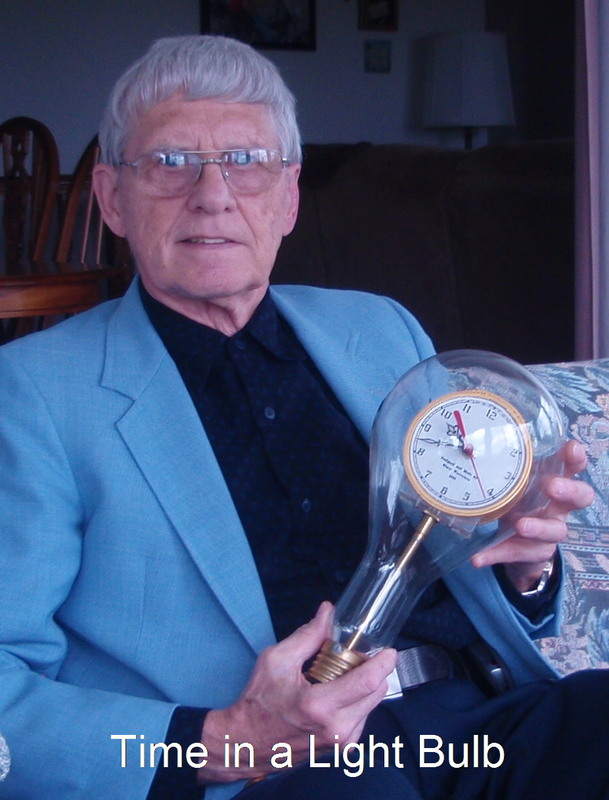 The article "Fun, Functional Double Clock in a Light Bulb" by Elmer Westerman appeared in the February 2012 issue of the Horological Times, the journal of the American Watchmakers - Clockmakers Institute.